During the last session, Anne F. Kennedy of Beyond Ink told us that it was time to move beyond ten blue links and start optimizing the rest of your digital content. Now she’s going to introduce a guy who will tell us all about that. 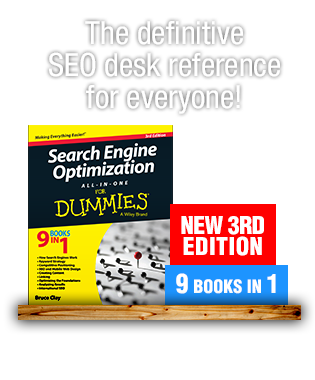 How awesome is Greg Jarboe of SEO-PR? He’s the only one speaking this session and it’s going to rock. He’s wearing a Buckeyes sweatshirt because he’s a University of Michigan alum. They lost again last night and he apparently is doing penance as a result. Sports are weird. Greg starts off with the still excellent fact that there are 9 billion searches on Google a month. And there are 10 billion videos viewed on YouTube every month. So who is really the heavyweight in that relationship? YouTube is the single most underutilized opportunity online. The market is extremely diverse. It’s not just kids and college students (though it does skew younger) but you’re still getting 35 percent of the people over 35. There are more male users than female. How do you get people to discover, watch and share YouTube videos? 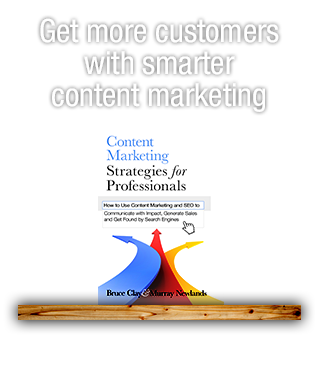 His book has nine steps to becoming a better marketer on YouTube. He’s going to boil it down to three in this presentation: discover, watch and share. You need all three to be successful. TubeMogul data, Feb 12, 2009: 45 percent of videos are discovered on video sites, 44 percent of videos are discovered on blogs, and only six percent are discovered with search engines. 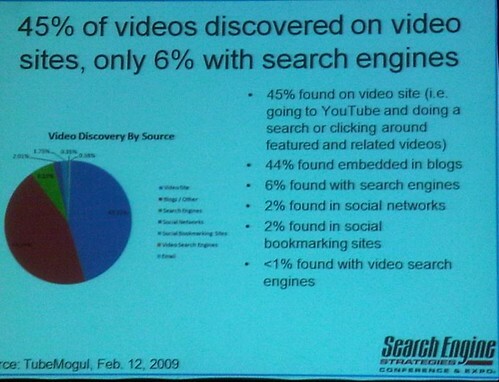 Less than one percent used a video search engine. If you’re only interested in optimizing for search… good luck, you’re chasing the six percent. YouTube has a different algorithm than Google, and you need to optimize for that. How does YouTube’s algo work? YouTube has something like Google Suggest. They try to guess what you’re looking for in the search box and they use recent searches to build those suggestions. When they optimize video on the fly, they guess at searches and see what comes up. There is a YouTube keyword tool that will also suggest terms. It’s not great data but it’s something to consider. It can be found at https://ads.youtube.com/keyword_tool. [Steve Ballmer video] on Google gets you the monkey dance. On YouTube just [Steve Ballmer] will get you the monkey dance. Think of your title as a headline. If you include brand name in title, it should go last. Be as detailed as possible (short of the entire transcript). Include URLs with http:// to playlist or Web site. Tags are not Keyword Meta tags. They’re far more useful and you should pay attention to them. Everything in your Title should be in your Tags. 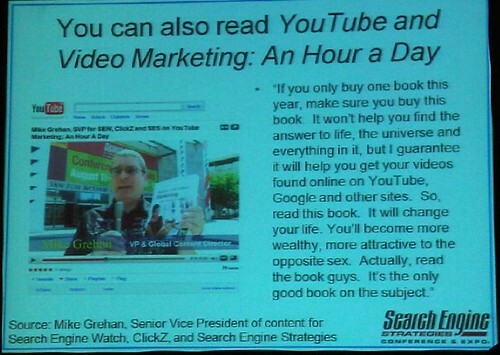 Compelling video content is the second critical success factor on YouTube. Most videos steadily lose viewers once “play” is clicked. You have 10 seconds and then 10 percent will be gone. Half will be gone at one minute. However, just pushing play is counted as a view. Ads don’t show up until after the ten second mark. Always make sure you’re using the latest and best specs. They’re a moving target. At the moment it’s 1280 x 720 and a 30 second refresh rate, but that’s today. ReelSEO keeps up with the specs so look there. You can combine them and mix and match. 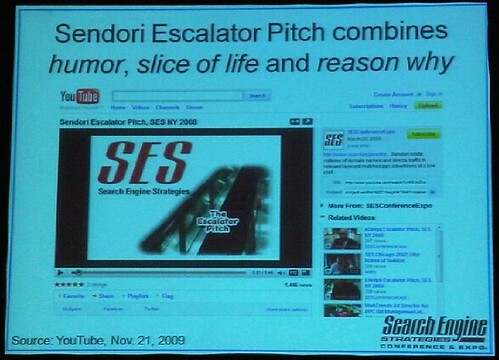 The SES channel did an experiment at SES NY and asked for “Escalator pitches” (the elevator was too slow). They also got Jason Calacanis to do a demonstration of My Mahalo. At SES Toronto, they turned the camera over to an attendee for a testimonial. They tried to interview the SearchMonkey there, but he didn’t talk. YouTube gives you analytics! It’ll tell you where people are engaging and when they’re dropping off. Even someone like Matt, where you think everything would be popular, will have dips and curves in attention. So now that they’ve watched it, sharing is the multiplier. You can’t fake that. You have to get the opinion maker. You can’t control them but you can influence them. Identify them, pitch to them, use promoted videos. Allow them to embed the video. It can provide a huge surge of views. Partner with people, interview people who will embed the interview in their blog. YouTube isn’t just cats riding on Roombas. (Though you can find them there.) Adorable but kinda dumb — unless you’re the VP of Marketing for Roomba. Look for opportunities to make something compelling. He ends with Mike Grehan’s testimonial for his book. Just… read the slide. Hee. Also, don’t bother with the branded channel. Free is all you need in most cases, unless you’re a media company trying to sell advertising. 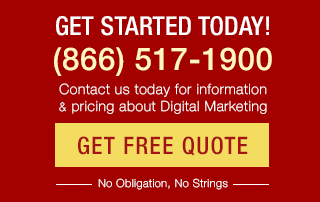 Should we post our TV commercials on YouTube? Greg: Probably not. Most of your commercials are created to watch, not to share. There are some that do work. Do a search for [ball girl]. It’s a video by Gatorade. It’s kinda like a commercial but it’s longer than the 30 second format. But don’t just repurpose something that is designed to be watched passively. Recognize that there’s a different format. Brent asked a question that I missed but Greg points out that one of the most underleveraged sources is Google News video. Recognized news sources get pulled for video results for news stories. What’s going on with B2B and YouTube? Greg: Blendtec is the classic example. Remember that their audience wasn’t home blenders. It was industrial blenders. Their sales went up 700 percent. The video views also gave them an opportunity to launch a B2C line, in the middle of a recession, successfully. Nike came to them and offered them money to blend a new sneaker. I used competitor terms in my campaign and took a lot of heat for it. Was I wrong? Greg: I agree with you. Video is higher up in the funnel. You should absolutely be going after competitor keywords at that point. You’re still changing minds. Obama used videos to change minds. Mitt Romney tried to raise money. One of them became president. Where should you put your URL in the description? In the middle or the beginning or the end? Greg: There’s not really anywhere to bury it. But you HAVE TO use http://, if you just use www it won’t become a link. It’s only four years old, it’s not very robust yet. Are annotations and captions indexed? Greg: Yes! Yes, yes. Go look at the Webmaster Central Channel. It’s all there. What should I know about audio specs? Greg: They haven’t evolved much. Video is evolving much faster. More and more videos are being watched on cell phones so consider those specs too. Should you put your videos on YouTube and embed them back to your site? Or should you stick to your “wrong” format? Greg: Just go out and do a new round of interviews. Embed them from YouTube onto your site. Isn’t Facebook a huge audience? Greg: If you look at the TubeMogul data, social networks are only two percent. It might explode but it’s underperformed so far.